"For me, Sweetheart Gazebo is a modest place of love. At once intimate and expansive, private and open, this most romantic shelter presents an image of the dual nature of love. Like the gazebo, love is private, comfortable, comforting; at the same time, love embraces the world and opens to its beauties. The image of romance would not be complete without a reminder of God's grace, which is the foundation on which all human love rests. The stream brings the gift of pure water to the garden, just as divine love nourishes the loving heart." Purchase unframed and save $100.00. Purchase unframed and save $150.00. Purchase unframed and save $200.00. 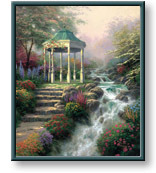 Sweetheart Gazebo copyright© 2003 by Thomas Kinkade is prohibited from being copied. All applicable copyright© laws apply and are reserved by artist Thomas Kinkade.